Located about 66 kilometres from Pune, Picaddle – Resort by Meritas is a luxurious 3-star property that boasts of grand suites, 65 comfortable rooms, a swimming pool, spa and more. Picaddle Resort is located on old Mumbai-Pune Highway, which is about an-hour-and-a-half from Pune via NH48. Picaddle Resort is a gorgeous 3-star property against a picturesque lush green backdrop of Lonavala. The resort has 65 spacious rooms, in-house multi-cuisine restaurants, a lounge bar, a spectacular swimming pool and jacuzzi, a party lawn, a spa and a salon. We particularly loved their contemporary suites spread over 550 square feet. Every suite has a living room and a master bedroom and is well-equipped with TV, wardrobes and a hot tub. The price for a suite varies between INR 6,999 and INR 8,999, depending upon the availability and the season. If you don’t want to spend so much, we recommend you check out their Executive and Deluxe rooms. For more details, click here. 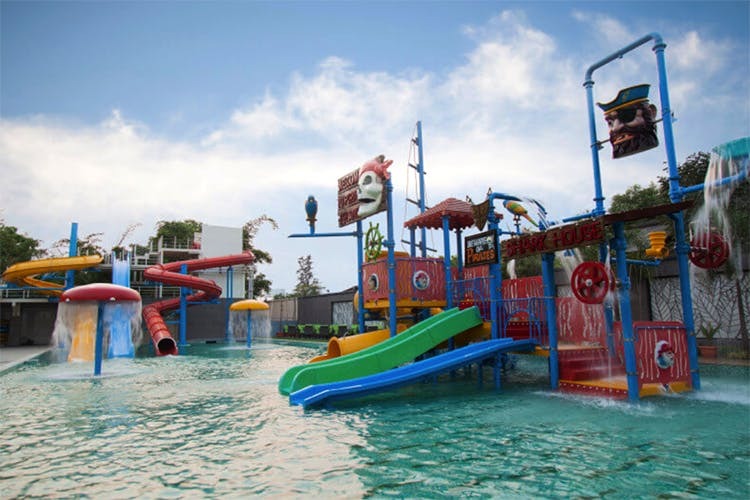 We hear Picaddle Resort all has their very own water park with super fun rides that you can enjoy with the fam. How cool is that?